However, increased speed can help you with your day-to-day freelance work as well. Have you ever heard of the Project Management Triangle? The basic principle is this: “Good, fast, or cheap: pick two.” In other words, if you’re a good worker, but you’re slow, you won’t be able to command as high a price. On the other hand, if you produce quality work quickly…you’ll be bringing in the big bucks! 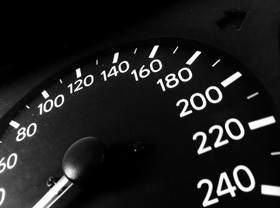 With that in mind, here are 18 tips to boost your freelancing speed. In an effort to “not waste any more time than I have to,” it can be tempting to dive into your work without planning. Don’t. You might “dive in” on the wrong end! By planning out your day ahead of time — or at least writing down exactly what needs to be done — you can save time by gaining the ability to view it all at once. You’ll also be less likely to become overwhelmed or procrastinate as both of those troublesome states of being tend to show up when we don’t know what to do next. With a plan in place, even if it’s simply a loose set of goals, you’ll always know what needs to happen next. Is it easier to do ten different tasks or ten of the same? If you’re like most people, the latter should prove to be easier. By grouping identical (or similar) tasks together, you’ll be able to increase your focus — taking the all-mighty “focus on one task at a time” advice all productivity gurus spew to a new level! — and your speed. When you switch between vastly different tasks, you lose time while your mind switches gears; but when you perform a string of similar tasks, you end up gaining momentum with each completed task. Related to the above, an additional benefit of chunking similar tasks together is that it’s easier to tell when “break time” is. And you really, really should take breaks. I know you’re going for speed here — so your breaks might be shorter than they usually are — but if you forgo taking a few minutes to yourself between tasks, you’re going to slow down, whether you want to or not. You risk burning out, physically (and possibly mentally). Until the robot overlords take over and provide you with a body that doesn’t require rest, breaks are a necessity. This sounds like a no-brainer, but your work will go faster if you don’t do it all yourself. Consider outsourcing some of your work to another party. Chances are there are at least a few tasks on your “to-do” list that don’t require your full hands-on attention. Even if you don’t feel comfortable relinquishing power of your business-related projects, you can still take advantage of outsourcing — try handing off your cleaning and other household chores to someone else. If you need to do your laundry and write a sales page, your day will go slower than if you just did the writing alone. You know yourself better than anyone. You have unique inside knowledge on how your body and brain work best together. Personally, I like working in the early morning (with the occasional nap thrown in if I’m still going at it in the afternoon); but what works best for me might not work for you. So, take your knowledge of self and use it to optimize your work hours. If you know you work better in the afternoon, ignore the gurus favoring early mornings and do what’s right for you. Forcing yourself to work in the morning won’t do you any good if you spend the first few hours staring into space. Close your email tab. Let your phone go to voicemail. Turn off your social media notifications. Whatever doesn’t have to do with the immediate task at hand can be set aside. (If you have trouble doing this on your own, there are programs available that can help you). No, I’m not telling you to skimp on quality when it comes to your work. I’m telling you to take advantage of computer and program shortcuts! Cut down on your mouse usage by using Alt + D to highlight the address bar on your browser. Use Ctrl + C/Ctrl + V to copy/past chunks of text. Ctrl + S to save your work. Learn the keyboard shortcuts for the programs you use and utilize them to your advantage. (Macs have keyboard shortcuts too — and even ways to avoid using the trackpad if you’re a MacBook user — so don’t fret). Even the fastest, most efficient worker will get bogged down if they’re not realistic about how many projects they can handle. Unreasonable, unrealistic deadlines can also be a boon on productivity. Deadlines should be challenging, yet doable. (Too much time encourages laziness; too little time cultivates mistakes and unneeded stress). If you know yourself (#6! ), you should be able to determine exactly how much work you can handle at the speed you’re striving for. As someone who’s self-employed, legally, your clients only have a say in the final product/results you produce, not how you actually do your work. And that’s a good thing, especially if you’re trying to get your work done quickly. Stay in control of your work process. If your clients dictate how you perform your daily tasks, you’ll end up losing time trying to “adjust” to their way of doing things. Do it your way. (Isn’t that why you became a freelancer in the first place?). Perfectionists, when they work up the nerve to do something at all, are some of the slowest workers on the planet. If you’re aiming to work faster, forget perfect. Aim for “good enough.” (And here’s a little secret: perfect freelancing doesn’t actually exist — just one more reason to focus on getting the job done rather than getting the job done “perfectly”). Studies have shown that music can increase your productivity, especially if it’s music you like. In other words, don’t force yourself to listen to classical music just because an “expert” told you to. If you hate what you’re listening to, it can slow you down. Choose something you like and see if it boosts your productivity. If it doesn’t, stick with silence. This trick doesn’t work for everyone, but if it works for you then use it. If you work at home and don’t live alone, it’s important to let everyone know what you’re up to. By letting your partner/housemates know that you’re working on an important project — that needs to be done quickly! — you can gain some much-needed alone time without hurting anyone’s feelings. The more experience you have with the task at hand, the more quickly you’ll be able to do it. However, even if you don’t have much prior experience, you can still perform your tasks quickly if you know exactly what needs to be done. Don’t be afraid to ask questions before getting started. Before you agree to take on a gig, make sure you have the equipment needed to perform the gig. Taking time out to head to the store to buy a new harddrive, a fresh ream of paper, a program upgrade, or what-have-you will severely take a bite out of your available work time. Also, make sure your equipment is up to snuff — empty your cache, clear your cookies, and remove any nasty malware/spyware/viruses you may have contracted to increase your computer and browsing speeds. Race against the clock, literally. Once you decide on which task on your to-do list to perform, also decide how long it should take you — then set a timer to keep you honest. Setting timers also help to keep you from getting wrapped up in one task for too long without taking a break. Timers can also be set for your overall “end time.” (I recommend telling yourself “My work will be complete by X o’clock” and sticking to it. Bonus points if you can hit the mark for an early end time). Sometimes socialization is required, whether you like it or not. If you can, keep your responses short. Stick to only what’s absolutely needed. And, of course, being honest and stating, “I’d love to chat more, but I have to get back to work” is a huge help. Tell whoever it is that you’ll get back to them as soon as you’re free. Eating, sleeping, and exercising are all-too-often thrown to the wind when we’re met with rushed deadlines. However, a tired freelancer is a sloppy freelancer. And freelancers with low blood sugar from putting off meals for “just one more hour” of work often make no sense at all! Take care of yourself. If not for your sake, then do it for your client’s sake — and for the sake of getting rehired for future work. The main key to working faster and getting more done? Make a decision to do it. Choose a task, complete it, choose another task, complete it, and so on. Often, the biggest difference between a “fast” freelancer and a slow one is who chose to do their work that day. Take action.